One of the dolphin carcasses that washed up on a Rhode Island beach. 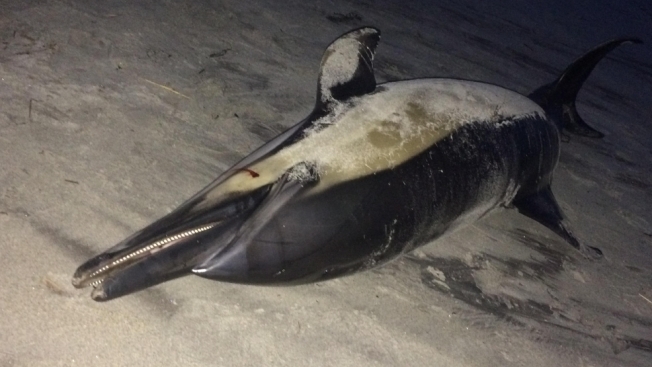 Officials say heavy rains may have played a role in the deaths of two dolphins found washed up along Scarborough State Beach in Narragansett, Rhode Island. Janelle Schuh, stranding coordinator at Mystic Aquarium, tells WJAR-TV the first carcass - a small, partially decomposed young dolphin - has been on the beach since Oct. 1. Schuh says the second dolphin carcass was reported to the aquarium on Thursday. Rhode Island Department of Environmental Management officials say the dolphins were both found on the beach's northern end. Schuh says it's unclear how the dolphins died or what species they are. Aquarium officials took samples from the smaller dolphin already and will return to do the same Friday for the latest carcass found.